Many of you are either working alone or on very small teams with limited resources. With some creativity, you can do quite a bit. In fact, many of my tips and tricks came from working in a similar situation. It’s amazing what can be done do with a computer and a little duct tape. With that said, working solo has some drawbacks. One of the biggest is not having peers (or a more experienced person) who can help you brainstorm and think through the process of building a course. You really are left to fend for yourself. Or so it seems. In the past we looked at how to navigate social media and manage all of the streams of information. We also discussed ways that being part of the community can help make you an elearning superstar. With today’s Internet and social media, you can redefine who’s a peer. And that’s a good thing. 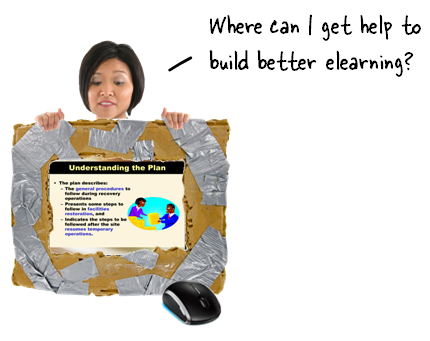 I get a lot of emails about how to get started with elearning or how to learn more. One of my first suggestions is to jump into the community forums and start asking for help. It’s good for help and for your career. In today’s post, I want to highlight a recent interaction in the community that shows how you can become better in your elearning design. Communities typically work like the image below. Most people aren’t active participants. They kind of lurk at the edges looking for a quick tip here or there and following the threads. Only a handful is active in real conversation. Lurking isn’t bad. There’s nothing wrong with looking for the quick tips and tricks. Who really has the time to hang out in communities chatting about elearning? Real people get real help. No one knows the lurkers who quietly observe and pull out the help they need. When you ask questions and engage in conversation, you become a real person. And people who are in the community want to help real people. Become part of the 5%. Become an expert. 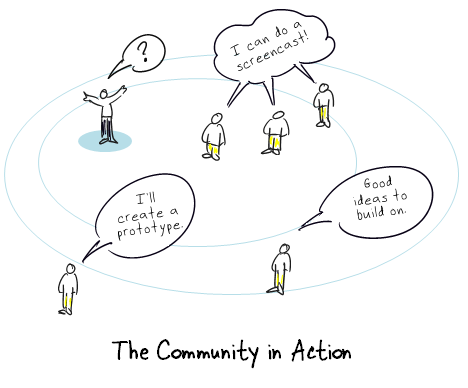 What’s common to the community is that everyone is developing expertise in some capacity. Sure we all come to it from different angles and levels of experience, but ultimately what binds us together is our pursuit to become better at what we do. Share what you know and try to help others, too. You’ll feel better and your goodwill pays dividends when you need help. Virtual brainstorming. If you’re working solo, odds are that you don’t have a place to think out loud or bounce around ideas. The community offers that. Are you working on a course and trying to figure out how to do something? Do you want some feedback from others? Jump into the community and ask. It’s one thing to talk about learning communities. But it’s another to make it a practical reality. 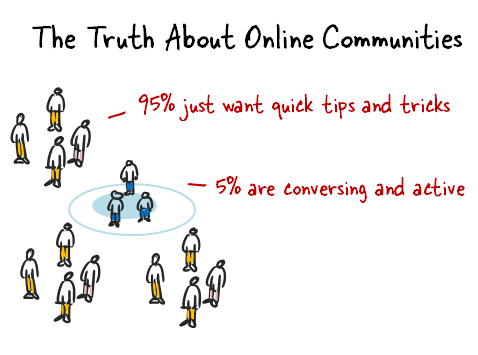 The truth is most of us don’t have time to hang out in online communities. We have work to do and can’t spend every waking hour checking links in Twitter, following threads in forums, and updating Facebook pages. Because of this, most people don’t fully participate in community activities. That’s fine. However, here’s a recent community interaction that is both practical and a great example of how the community offers real valuable help and not just good discussion. Joe Deegan is a recent Articulate customer. And he’s quickly learned to get his value out of the community. A while back he posted a question looking for ideas on building an interactive sales course. My guess is that he got at least ten good ideas to play around with. I am working on a project where I am creating a slide that looks like the inside of a store that my users work in. I am having a hard time adding perspective to the floor so that it looks 3D as if I am inside the room. I’ve seen many of you do a great job of this so I wanted to get your ideas on how I can make my scene look better. 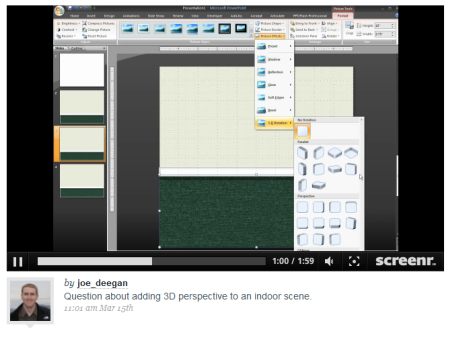 He uploaded a quick screencast of what he wanted to do; and then asked for some help. You can follow what happened in the community by clicking this link. But I’ll give you a quick rundown. I especially like the way Bruno took the essence of the conversation and created a quick screencast that not only addressed the original question, but also shows some great PowerPoint tips. Check it out, below. Click here to view Bruno’s tutorial. hen they hired him, in a sense they also hired a team because Joe comes bundled with his network of resources. So if you’re a Joe Deegan and want to learn more (or just need help with your courses) don’t be afraid to jump into the community. You’ll find it a great experience and get the tips and tricks to help you grow as an elearning developer. I think that Articulate community is really useful! Many times I had to face some problem during the developement process, and I always got the right responses! Ya i agree with you italgo. Thanks for this timely topic, Tom. After facing a difficult year professionally, it occured to me recently that there were many occasions where I’ve lurked (here and elsewhere) benefiting from the knowledge base but haven’t given much back in awhile. I like these blogs. They help me learn. Thanks for the great compliment Tom. I keep telling my Boss that he needs to pay me like a team 🙂 As the lone instructional designer and eLearning developer in a small company I definitely value the feedback and tips I get from the community. I do think of my network as a team and it has definitely helped me to make more with less. Looking forward to throwing some more of my challenges out there to see what you all can come up with. Thank you Joe Deegan for throwing out the challenge, and thank you Tom for the honorable mention. I have learned a lot from the Articulate community….it’s great to give back. I just want to add my thanks to those already posted. I too am a one-woman team. I work with two other instructional designers but they focus solely on our face-to-face content. They don’t understand nor have interest in the eLearning side and so aren’t interested in brainstorming sessions. I’ve learned so much from the forums, blog posts, and Screenrs. You guys are a great extended team! I also, like Joe, have to work alone. So I have to face all the production steps. Personally I do not suffer it, and I think it also opened a door to me when I was seeking for a Job. One of the things I first said to the potential new boss, and that I have demonstrated, was that hiring me he was hiring a one-man-band. Also, it is important to me that I’m rising my skills everyday, by knowing something new in several and different kind of the production steps. It puts no brakes on my individual growth. Something I hope to invest in a different way in the future, eg. by creating a new company by myself. Maybe sometimes I desire a helping hand, just because I’d like it to work on more projects simultaneously, which for obvious reasons is something I can’t do now. But in terms of design and construction, I feel as there are lots of people with me. I also think screenr gave an enormous push to this! I love and use the blog. Where do I sign up for a forum or list serve? Another great topic! The company I work for (software) is currently investing a lot of time into investigating how people learn, and more and more people are learning by going to communities to solve problems, get information, and learn. It is a nice reminder that these communities become a great go-to place because of people participating and that we need to contribute when we can even if it is once per month. Well I must admit I’m one of the 95% lurking types you mentioned. I’ve been religiously following this Blog for over a year or so now and I have gotten great ideas from you Tom and others on this blog on how to improve my online classes at a major University. I’m also an e-learning lone Ranger at the school with little supports and no money but what I have learned here has contributed mcuh to my teaching and learning. My students are impressed with what I have produced to date. Thanks to all of you who actively participate. You’ve been a great support group even if this is the only time I have dared to respond. Be well. italgo, I love that comment about being a one man band. That’s a great way to describe it. Hope you don’t mind if I use that one. I agree that sourcing advice from online communities is essential when starting out. Without blogs such as these, I would still be banging my head against the wall. That said, although I am comfortable with the direction I want to go in, I cannot say the same for the rest of my team. I work in a very corporate industry and thus my graphic designers are only interested in building simple ‘page-turners’ with very low visual elements, i.e. mainly text and some screenshots. This may be ideal for our clientele, but I am still a little dubious, and I cannot find many references on the net on how to build a simple, page-turner. Is this because they are not ideal? Is elearning in 2010 all about interactivity and lots of colour to engage the learner? I am concern that learners will find our courses dreary and boring! @Maisy – that’s a great question and one of the more important ones we see in the community. Page-turners are just one e-learning model. Interactive scenarios is another model. Both models have pros and cons. Feel free to join the discussion or begin a new thread for your specific challenges! Thank you for a thoughtful post. I’ve been working hard at building a community at elearningcouncil.com (one that you and David have supported). This post gives me great ideas on how to grow that community. I must have visited this blog several times a week but its my first time to write a comment here. I sincerely appreciate hearing brilliant minds here sharing inputs on what nots. I already shared this site with my friends too. All i can say is that the articulate community is the best! E-Learning can be such a great learning platform, it is also a great way to learn from others. I love your blog. I am an Instructional Design student and I appreciate all the tips you give regarding technology. I also want to thank you for encouraging people to participate in the online learning community. It seems you have drawn out a few of the lurkers (me included!) to participate in the dialog. Thank’s 🙂 really useful community ! I don’t even use Articulate, but I make a point of reading Tom’s posts, because he shares techniques and ideas that apply far beyond how to use a particular tool. “Start asking for help.” Yes, that works. Try to ask intelligently–grapple with the problem yourself for a while, and think about what you’d like to know. “My car’s acting funny” isn’t a useful description. “I think my car needs a tune-up,” on the other hand, is a question dressed in a solution costume (and one that’s not very flattering). Tom’s point here that 95% of people in a community “just want quick tips and tricks” is accurate enough. What that means, though, is that when you go beyond that, you become part of that active, networking, valuable 5%. You know things, and if you’re working at your craft, you know about what you don’t know. Experiment. Reflect. Try things out. And share what you know with others. @Dave: good stuff. I always see the community as an extension of the cubicle, especially for those elearning folks who work by themselves.